Homeowners who live in Buckhead, the uptown district of Atlanta, Georgia, can find quality foundation repair services at Atlas Piers of Atlanta. Because of the hot, humid summers and cool winters in the area, foundation problems are not uncommon. Frequent temperature changes and the variation of the moisture content of the soil can wreak havoc on your home’s foundation. These conditions cause the soil to shift, expand, contract, or settle, leading to several different foundation problems. Too much moisture can also cause foundation problems, as excess groundwater leads to erosion or increased hydrostatic pressure. 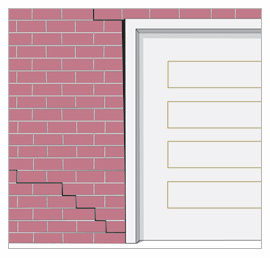 If you notice signs of foundation failure in your home, contact foundation repair experts at Atlas Piers immediately. If you see any of these issues, contact the repair team at Atlas Piers right away. We have several options to help restore your home to top condition. When it comes to foundation repair, we have all of the necessary solutions to ensure that your home is well supported and protected from the dangers of foundation failure. For settling and sinking foundations, we use underpinning methods to provide support. 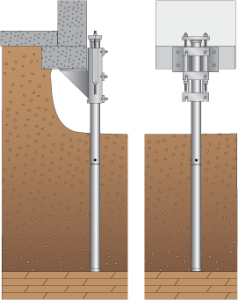 Helical piers and steel push piers can be driven or screwed, in the case of helical piers, into the load bearing soils deep underground to stabilize the above foundation. Another solution fore settling foundations is pressure grouting, a method by which a cement based grout is injected beneath the concrete to fill voids in the soil and lift the foundation. For shifting foundations, bowing and leaning walls, and foundation wall cracks, we install helical tiebacks. These are large, screw like devices that anchor horizontally into the ground, applying opposite pressure to counteract the bowing basement wall. Carbon fiber strips can also be applied to the wall to straighten leaning and seal cracks. If the foundation problems in your home are causing water to seep into the basement or crawlspace, encapsulation services may help. Encapsulation is the process of installing a vapor barrier along the interior of an area to seal out moisture. We also offer specialized services, such as new construction piers, micro pull down piles, hardscaping, concrete repair, brick and masonry repair, porch piers, and more. If you live in the Buckhead area of Atlanta, contact Atlas Piers today to find out more about our professional foundation repair solutions.